Our pantry has half a shelf dedicated to cereal. 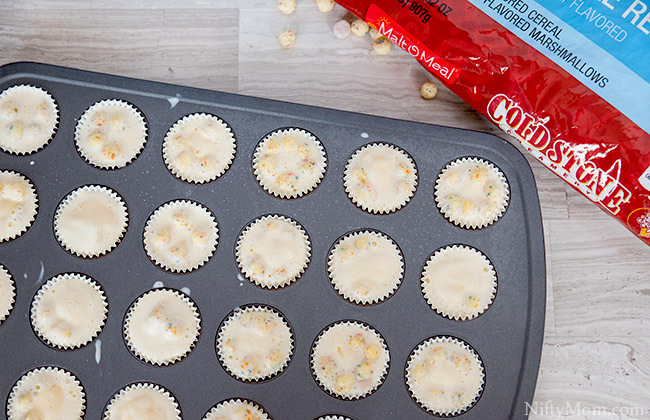 It is not just because I have three boys whom all love to eat cereal, it’s also because I love using cereal in a variety of recipes, including these mini ice cream bites featuring Malt-O-Meal® Cold Stone Creamery Birthday Cake Remix™ Cereal. You already know that ice cream is basically my favorite dessert and when I see two of my favorite things come together, I have to give it a try. Cereal and ice cream… need I say more? In a dream pairing of cereal and ice cream, two American heritage brands, Malt-O-Meal® & Cold Stone Creamery®, are coming together to offer the first of its kind ice cream themed cereal. 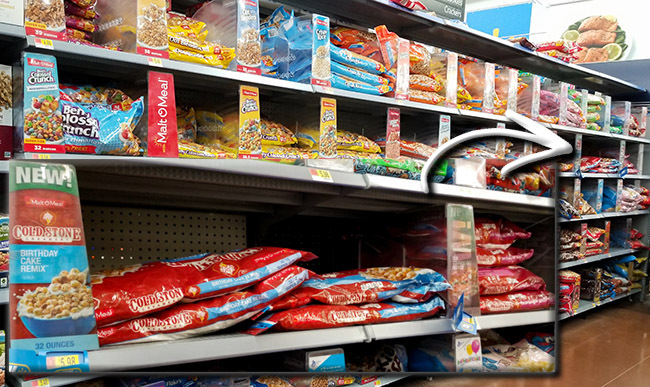 The bagged cereal is available at Walmart in two flavors: Our Strawberry Blonde™ (honey graham and strawberry flavored cereal with marshmallows) and Birthday Cake Remix™ (birthday cake flavored cereal with chocolate flavored marshmallows). The Malt-O-Meal® Cold Stone Creamery Birthday Cake Remix™ is based on a much-loved ice cream flavor, which the taste is layered on with unique Cake Batter™ Puffs, colorful Sprinkles and Chocolate Marshmallow Bits. 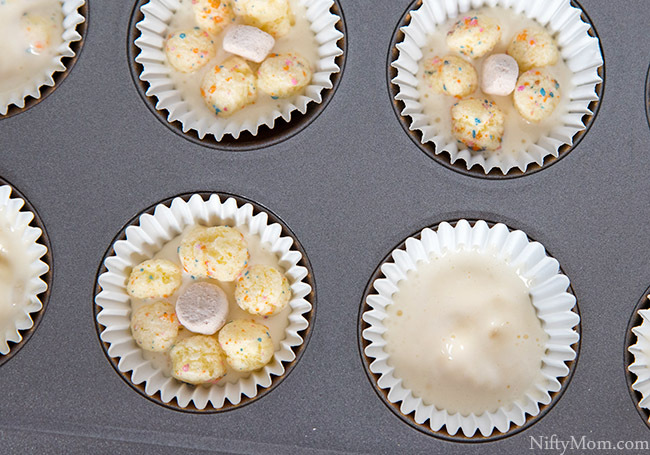 Thinking of all those delicious flavors, I was inspired to make these delicious mini ice cream bites. Take vanilla ice cream out of the freezer 15 minutes before making the bites, to allow it to soften. 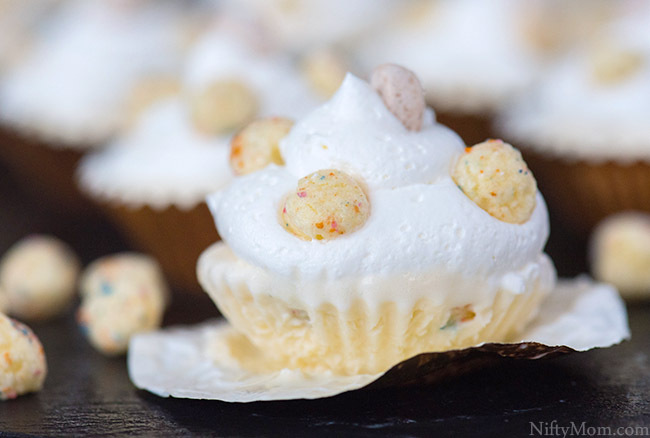 Put mini cupcake liners in each opening in a mini cupcake tin. Using a small spoon, fill each liner halfway with softened ice cream. 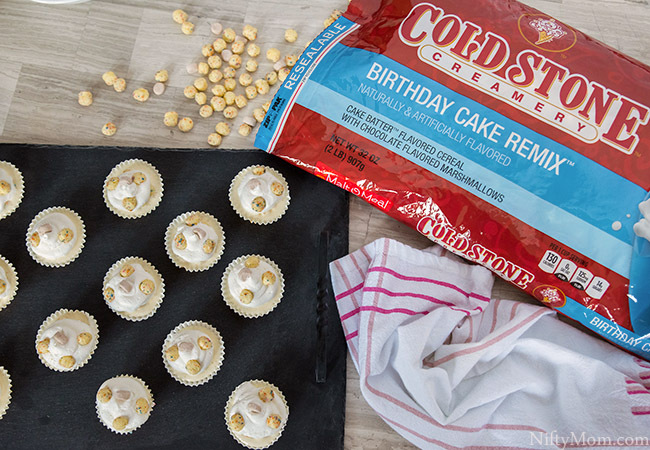 Add 6-8 pieces of Malt-O-Meal® Cold Stone Creamery Birthday Cake Remix™ cereal to each one. Top off with more softened ice cream. Place the tin in the freezer for 1-3 hours to set. 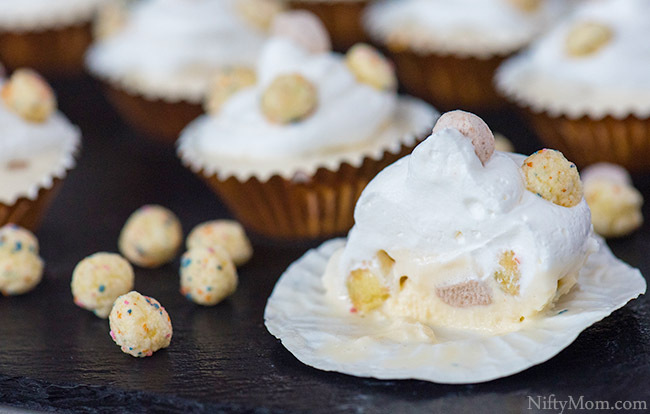 The cereal may come to the top of the ice cream and that is totally fine. Remove frozen bites from the pan. 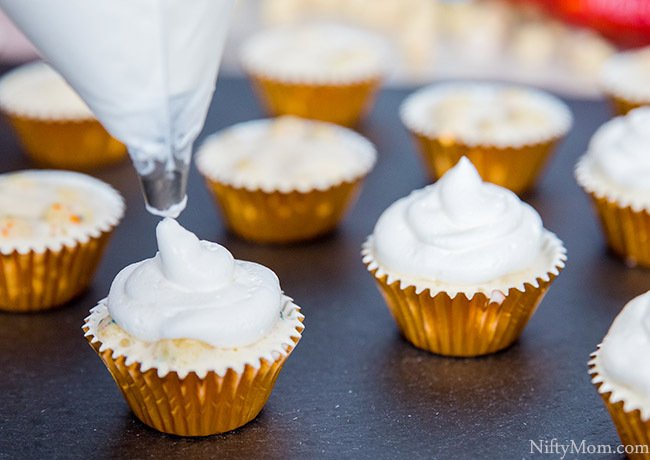 Top each bite with whipped cream. 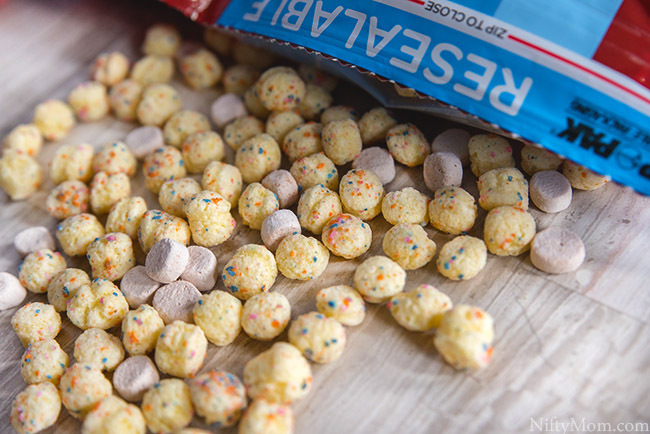 Finish them off with those delicious pieces of Malt-O-Meal® Cold Stone Creamery Birthday Cake Remix™ cereal. Be sure to eat immediately or return to the freezer until you are ready to serve. Since they are small, they will melt a little quick, but they are delicious and a good size when you don’t want a whole bowl of ice cream or a huge dessert. 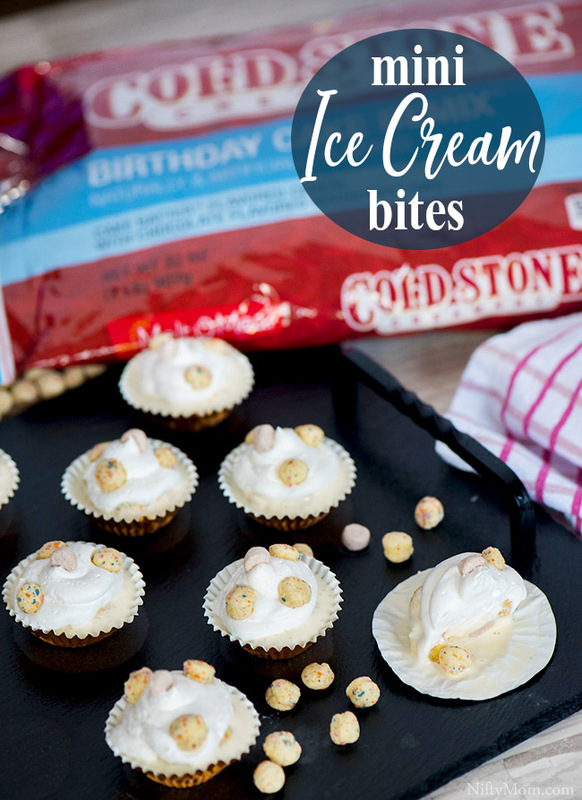 These mini ice cream bites are an easy dessert featuring the new Malt-O-Meal® Cold Stone Creamery Birthday Cake Remix™ cereal. 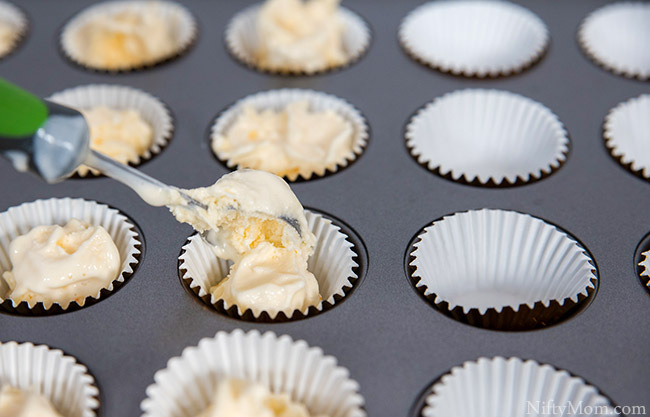 Take vanilla ice cream out of the freezer 15 minutes before making the bites, to soften. Using a small spoon, fill each liner halfway up with softened ice cream. Place the tin in the freezer for 1-3 hours to set. Top with whopped cream and pieces of Malt-O-Meal® Cold Stone Creamery Birthday Cake Remix™ cereal. Eat immediately or return to the freezer until ready to eat. 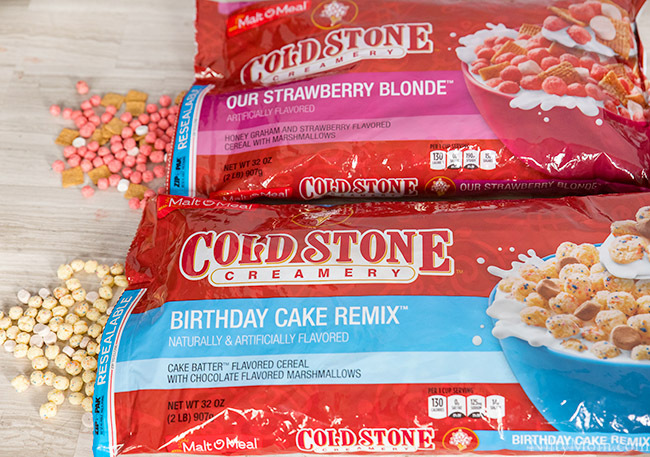 Head to Walmart to get Malt-O-Meal® Cold Stone Creamery Birthday Cake Remix™ and Malt-O-Meal® Cold Stone Creamery Our Strawberry Blonde™ cereal. You can also earn cash back with this Ibotta offer. Click above to earn $1 with the purchase of Malt-O-Meal® Cold Stone Creamery Birthday Cake Remix™ at Walmart. Earn $1 on Ibotta here with the purchase of Malt-O-Meal® Cold Stone Creamery Our Strawberry Blonde™. 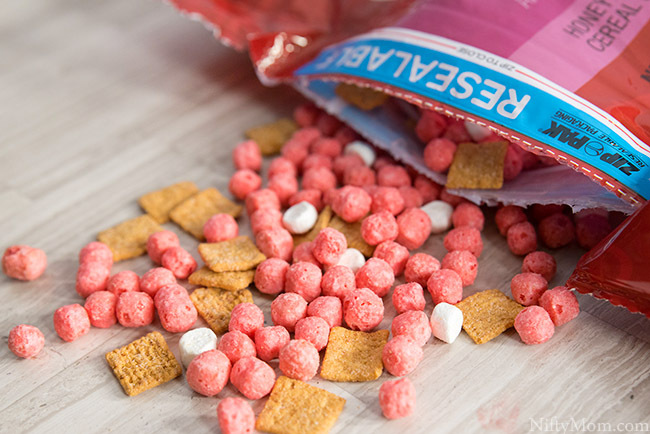 What desserts are your favorite to make with cereal? The COLD STONE CREAMERY name, mark and associated marks are owned by Kahala Franchising, L.L.C. used under license.